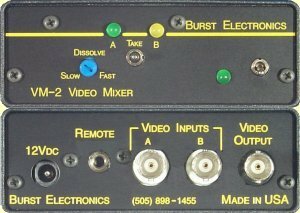 The VM-2 is a two channel video mixer. The unit allows fade between two genlocked video signals. The fade "take" is both local and GPI remote controlled. Fade rate is adjustable from approximately 5 frames to 5 seconds. The VM-2 is similar to the VMF-2, but without the Remote Control Unit (RCU). If fade to black is required, then our Model VMF-2 is the solution. The more cost effective VM-2 does not include fade to black.